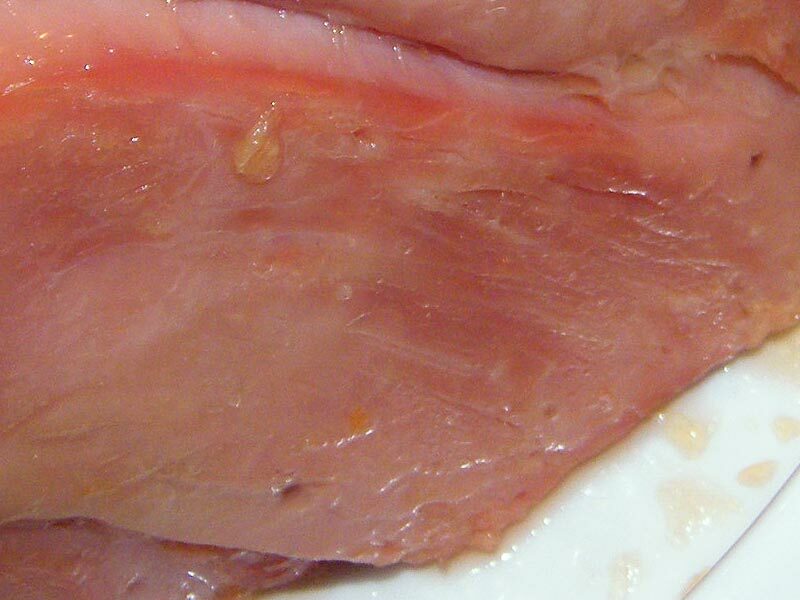 Ham is traditionally reserved for special occasions, especially for Christmas and New Year dinner. Last December, I experimented with glazing and after a couple of tries, I have one which I (and others who had the amazing opportunity to taste it) am happy with. My glazing recipe involves mixing equal parts in volume of sweetened fruit juice (pineapple with some peach is good) and beer, plus a couple of heaping tablespoons of honey. In my glazing batch, I had half a bottle of beer, that should help out with measurements. 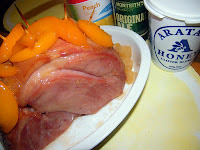 And as you can see in the photos, I stuck some peach and pineapple on top of the ham to help flavour it along (but if you have pure juice in cans, don't sweat it). And that, is my not-so secret glaze recipe (which friends had been asking for; sorry it took a couple of months before I finally got it posted!). If you want to know more about baking ham, I found this information from yellow.co.nz (yes, it's the phone directory!) very informative.